It’s the people who do all of the work all the time who eventually catch on to things. 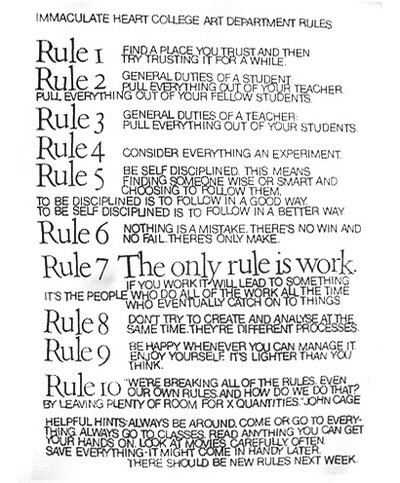 I love these rules and I read this list over and over, but it’s Rule #7 that is most important. I want to tattoo it in reverse on my forehead so I see it every time I’m full of self-doubt and look in the mirror trying to find something. There is art inside us. It might not feel like it, but you don’t have to give yourself permission to make art. Maybe you just don’t know how to start. When I was young, we used to pick a sentence from a poem we liked and write starting from that. It didn’t always lead anywhere amazing but it always lead somewhere different. Overcome that initial inertia. Start something. It’s OK to use someone else’s art as a starting point. Hell, that’s how I started writing this. I once used a line from the William Stafford poem The Day Millicent Found the World to write one of my favorite teenage poems. And now not only the giant trees were strange. How could you not find something to write about that? Originality comes from work. It comes from churning out piece after piece with no thought to its quality. Don’t you see? It’s the repetition that makes you better. Dig until you find something real and don’t stop there.